Dear moms and dads, please note that your annual enrolment includes one T-shirt. You will need to indicate the size you need in the Enrolment form above.Should you wish to order an EXTRA T-Shirt/s for your child, please fill in the Extra T-Shirt order form below and select the size of the shirt/s again. 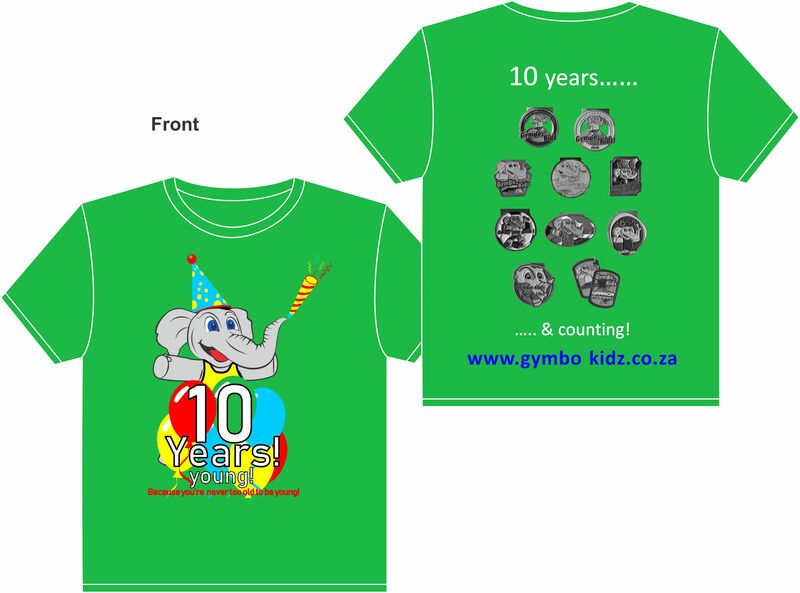 Extra T-shirts are available for sale at R90 per shirt, once you have paid the Enrolment fee of R180. Cash sent in a sealed envelope (Marked with child's full name/T-Shirt) to your child's school. (Please make sure that your child's school accepts the responsibility of keeping cash for Gymbo-Kidz). Once you have received your child's t-shirt and you are not happy with the size of the shirt. Please contact us immediately to swap it from our existing stock. If we do not have the size you want in stock it will take up to 14 working days to get the new shirt to you. Parents who have ordered t-shirts but have outstanding term fees are asked to settle their child's term fees with their payment for the T-shirt/s. Please note that shirts will only be delivered once all accounts are up to date.